We probably should’ve bought a boat instead of a coach…we just love water! Since leaving the California North Coast March 18, we’ve touched the Gulf waters, Atlantic waters, toured past numerous lakes, and crossed countless rivers. Each brings us a special experience, whether it’s the scenery, the waterfowl, the refreshing breeze, or the many boats & ships & watercraft floating past. We’ve finally reached one of our favorites…the waters of Lake Michigan. 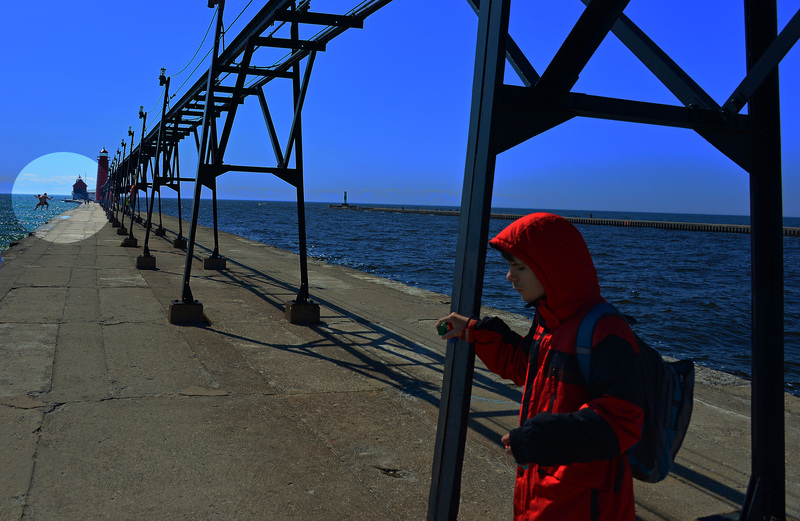 The special experience for us with Lake Michigan always involves…. We have finally finished all our routine doctor appointments, routine and not-so-routine coach maintenance appointments, and we’ve stopped for a few days outside Grand Rapids at the farm of our friends Rich and Laura. 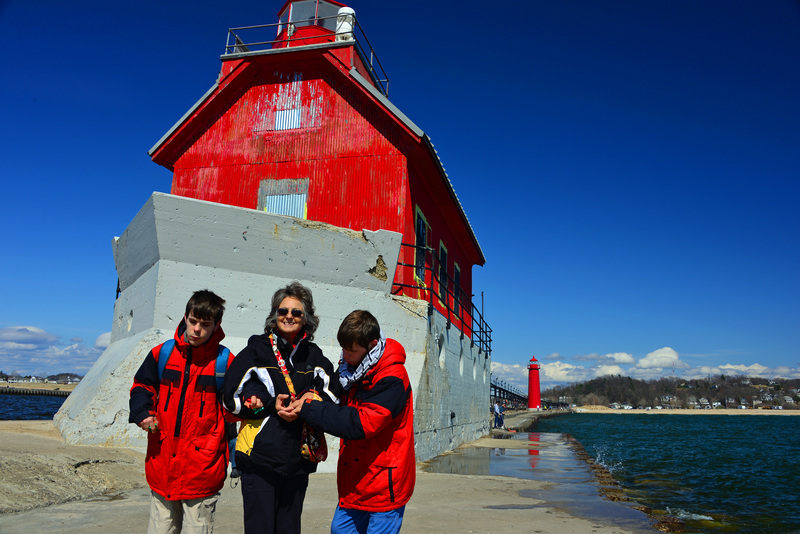 It’s just a few miles to Grand Haven and one of the most comfortable waterfront experiences we have encountered. The Grand River runs behind Rich & Laura’s property, and passes Grand Haven’s downtown as it empties into Lake Michigan. The city has really done a lovely job of developing the river- and lakefronts for many types of recreation. 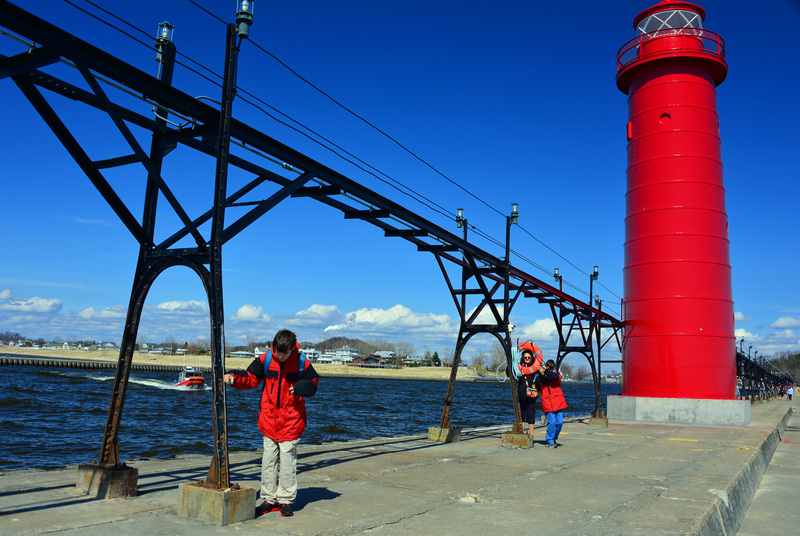 We like the part where we walk along the river’s edge, past the sandy shoreline, and out on the pier past the lighthouse to the very end with the red building! Notice the Coast Guard boat in the channel seems to be steering right for us? Oops, they were…an alarm triggers with the Coast Guard when you pull the ring off its hook. The boat was already in the channel, so they didn’t launch because of us…but we put the ring back pronto and walked away quickly…. Notice also that we were wearing winter coats? It was in the mid-50s, but the wind was brisk and cutting. I mention that to help you understand the significance of the next photo. 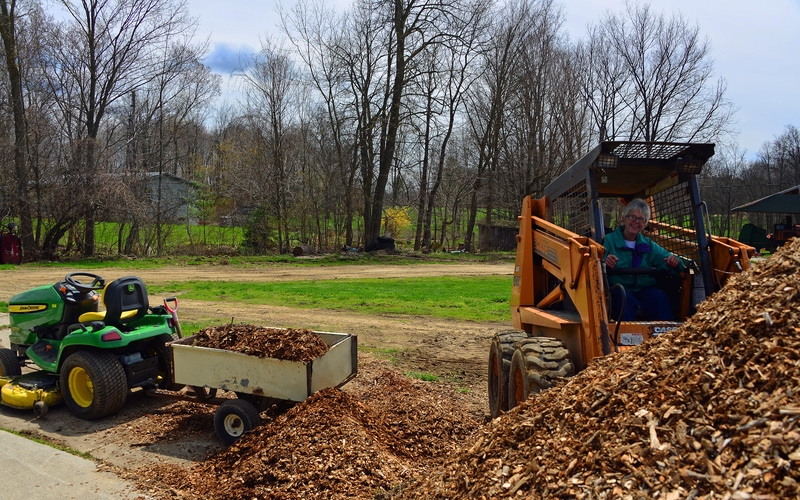 While we were out and about enjoying the shoreline…Laura was back at the ranch doing spring mulching. She does it in a big way…. Hey this is where we live-you should give us a call! Ohhhh, that’s right! Check your email….